Highlights of the ninth part of the ‘Our Mutual Friend Tweets’ project can now be found on Storify! Click here to catch up on the latest developments. Don’t forget that you can come along and discuss this month’s instalment (January 1865) with Prof. Michael Slater (Birkbeck, University of London) and Dr. Holly Furneaux (University of Leicester) tomorrow evening. We will be chatting about the personal and publishing context of this month’s instalment, its place within the novel overall (no spoilers though! ), and the idea of the counterfactual – or what if? – in serialised fiction. We will be in the Keynes Library, 43 Gordon Square (Birkbeck School of Arts) from 6pm onwards. All very welcome – and the event is absolutely free! This guest post was contributed by Martha Stoddard Holmes, Professor of Literature and Writing Studies at California State University, San Marcos. In this instalment, Bradley Headstone, ‘smouldering’ with unconquered passion, returns to Lizzie Hexam’s temporary lodging where he again encounters a dragon at the gates in the form of Jenny Wren, the self-proclaimed ‘Person of the House’ (167). Jenny exemplifies Dickens’s studies of the scandal of the child who shoulders adult responsibilities like caring for Mr. Dolls, her ‘bad child’ alcoholic father. Similarly, while younger than Lizzie, Jenny takes on the role of duenna, protecting and advising her friend regarding the two men who desire her. While she has already evaluated both Bradley Headstone and Eugene Wrayburn in month six’s instalment (and seems to have a clear preference for Wrayburn, as much as she can prefer anyone who might hurt Lizzie or take her away), Jenny continues to investigate Bradley on his second visit. She interrogates him about his intentions, directing him to face a doll she names ‘The Honorable Mrs. Truth’ or ‘Mrs. T.’ (260). While his profession as a schoolmaster and purveyor of the same ‘mechanically’ acquired knowledge that moved him out of the pauper class makes him more accustomed to directing others, Bradley obeys the girl’s orders without question (259). Come and read Our Mutual Friend with us! Keynes Library (room 114), Birkbeck School of Arts, 43 Gordon Square, WC1. 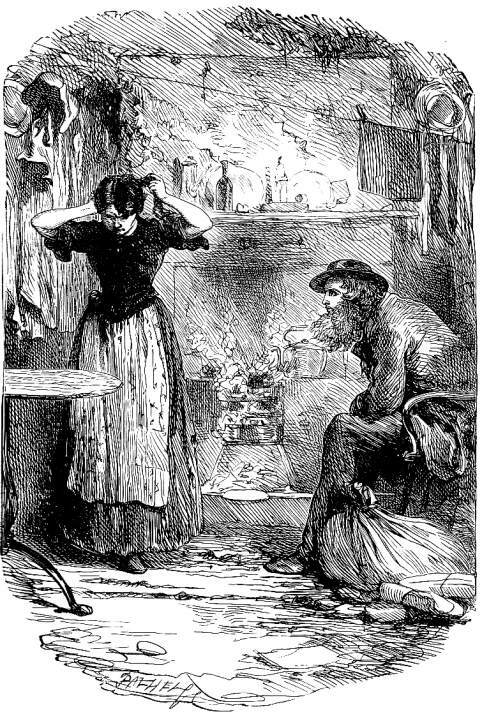 The first event of the spring term for the Birkbeck Forum for Nineteenth-Century Studies will feature Professor Michael Slater (Birkbeck, University of London) and Holly Furneaux (University of Leicester) discussing the latest instalment of Our Mutual Friend, as part of Birkbeck’s serial reading project. The January 1865 instalment of the novel can be read here, and more information on the reading project can be found here. This event will also feature a reading from Michael Slater. Were you a fan of the recent podcast Serial? Brett Beasley (Loyola University Chicago) considers the recent enthusiasm for serialised stories and suggests joining the Our Mutual Friend reading project for those suffering Serial withdrawal symptoms. Brett will be contributing more to our blog in the coming months, too. This month’s post was contributed by Joanna Robinson, AHRC Collaborative PhD Candidate at King’s College London and the Museum of London. The reader may be forgiven for imagining that Pleasant Riderhood would be a haughty and imperious woman, as her refusal to ‘be regarded in a certain light’ precedes her into the text, accompanied by Mr Venus’s mournful lamentations. Disembodied, her voice is amplified, as Venus’s despair grows more acute with every repetition. Thus, it comes as a surprise in chapter twelve when she is repeatedly silenced by her father. Resilient, but pitiable, Pleasant’s emotional responses can only be articulated by her ‘sympathetic hair’, which quietly expresses what she is prevented from saying. (360) So, although Rogue Riderhood blames ‘Poll Parroting’ for the events of chapter twelve, the January number of Our Mutual Friend in fact presents a series of instances in which speech is denied or resisted. The chapters give the reader a privileged insight into the secret desires and fantasies of several characters, and John Harmon speaks as himself for the first time, yet problems of expression remain. Even while Dickens chooses to begin the New Year with the significant disclosure of John Rokesmith’s true identity, the January chapters entwine themes of speech and censorship in complex ways.